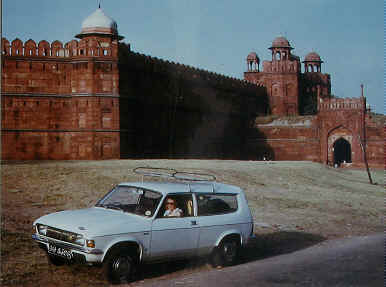 From Delhi, India to UK overland. < 1 2 3 4 5 6 7 8 . 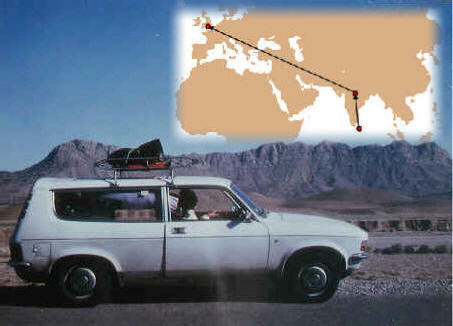 More than 8,000 miles overland in an Austin Allegro. and Turkey in a state of political turmoil. In 1979, Richard Dening (better known as Tim) and his wife Elisabeth (Betty) drove home to West Sussex in England from Delhi, India. They accomplished this adventure in an Austin Allegro 2 car. Tim had originally shipped the brand new car into Sri Lanka at the start of a three year post as a consultant in Sri Lanka. The intent was to sell the car at the end of the contract. However, in the end, they decided to drive it back to England instead. Tim undertook the journey from his starting point in Colombo, Sri Lanka, to Delhi, India on his own. He set off by ferry across the Palk Strait to India on the 8th March 1979 and travelled up the west coast of Kerala. There were opportunities for many activities en route, including visiting agricultural research stations (Tim was an agricultural economist), photographing tigers in the Kanha National Park and flying to Katmandu for a spell in the Himalayas. Betty joined him in Delhi after returning from a brief trip to England for family reasons. They spent the first two and a half weeks touring North India, visiting agricultural projects and meeting up with old friends from Tim's Indian Army days in the Second World War. Betty kept a journal recording their initial travels in India and their subsequent journey home, which is reproduced in the following pages. Much later, Tim also wrote an article for British Leyland Motor Corporation about their journey home, prominently featuring the car. You can access Tim's much condensed version of the trip here.